A mini-co-op winery formed by 10 growers in and around the village of Estézargues, where their cellar is located, which lies roughly between Avignon and the famous Pont du Gard viaduct (without mentioning the Romans). They favour a 'natural' winemaking approach apparently (who doesn't nowadays). These two cost about £10.95-£13.95 at Roberson's in London (so posh prices then); and the US importer is Jenny & François selections. Les Galets 2012 Côtes du Rhône (Grenache, Carignan; organic, 13.5% abv) - perfumed nose, quite light texture (although not in alcohol) with tasty berry fruit finish. Grés Saint-Vincent 2011 Côtes du Rhône Villages (Grenache, Syrah, Cinsault; organic, 14% abv) - similar profile perhaps although more concentrated, powerful and elegant too, paradoxically, with a light bitter twist of tannin. Michel Coullomb's vineyards lie on rolling pebbley terrain around a little place called Montfrin, sitting pretty much smack in the middle of a crow-flies line between Nimes and Avignon (just in the Languedoc technically). Available from Leon Stolarski Fine Wines in the UK (£ price quoted) and Mitchell & Son in Dublin (€). Cocagne 2011 Côtes du Rhône (Syrah, Grenache) - hints of toasted choco oak, lots of minty dark cherry fruit though, rich vs firm palate with concentrated finish; nice style. €18.50 cellar door. There's a short-and-sweet profile (scribbled a couple of years ago) of this quite exciting off-the-beaten track estate winery in wild Séguret country, owned by the McKinlay family, and some of their previously tasted vintages HERE. A trio of more recent releases are reviewed for your pleasure below. UK: the Wine Company (Colchester), Big Red Wine Co. (£ prices quoted). Good distribution in the US it seems: the two 'Villages' reds here are about $20+ and $25-$30. Tradition 2011 Séguret Côtes du Rhône Villages (Grenache, Syrah, Carignan) - enticing sweet liquorice and dark berry fruit, hints of spice and dry grip vs fairly soft and tasty finish. £10 (case price) to £13.99 a bottle. You'll find previous words on this fairly go-getting co-op HERE (about their sumptuous fortified red Vin Doux Naturel) that basically forms the backbone of the Rasteau village appellation, supplemented by a handful of very good independent estates (some of them are linked below); and HERE as well (note on the 2011 'Tradition'). Here's what I thought of two of their latest vintage releases. Ortas 'Tradition' 2012 Rasteau (Grenache 70%, Syrah 20%, Mourvèdre 10%, 14.5% abv) - Deceptively fruity and soft at first, turning warmer and more powerful, plenty of tasty blackberry/cherry, damson and liquorice with earthy touches; a hint of dry grip vs sweet ripe fruit, spice and oomph to finish. Drinking nicely now. €7.90 cellar door, £9.95 Hercules Wine Warehouse (Kent, UK), €14.49 O'Brien's (Ireland). 'Prestige' 2010 Rasteau (Grenache 50%, Syrah 35%, Mourvèdre 15% from very stony hillside terraces, small proportion aged in oak; 14.5% abv) - rich ripe and earthy with liquorice and kirsch notes, peppery and minty too; concentrated, powerful, solid and grippy vs lush dark berry fruit with spicy edges; tightens up on the finish, still a bit young although drinking well with the right kind of food, e.g. Chinese roast duck actually. €18.49 O'Brien's, €10 cellar door. Rhône: "reds of the moment"
And there's a bit of 'blurb and bottles' from the northern Rhône as well lying craftily below this post (or click here:) Domaine Belle, Crozes-Hermitage. This quirky independent Champagne house was created and has been run by the Dumangin family since the 1880s. Quirky in that their Champagnes are much drier than most of the big brands and own-labels – the dosage levels (added to all traditional method fizz, except for 'Brut Nature' or 'Zero' styles, as a sweetener essentially) in the five I've reviewed below have from just 2 to 8 grams/litre residual sugar, whereas 10 to 12 or more is the norm for a so-called dry 'Brut'; and each dosage 'liquor' is lovingly “aged in perfumed oak casks,” which I'd never heard of before. The company also still does the 'riddling' by hand apparently - the process where the bottles of Champers undergoing second fermentation in bottle are slowly shaken and tilted upside-down, before the yeast sediment is 'disgorged' – which is generally done by mean machines called 'gyro-palettes' nowadays. 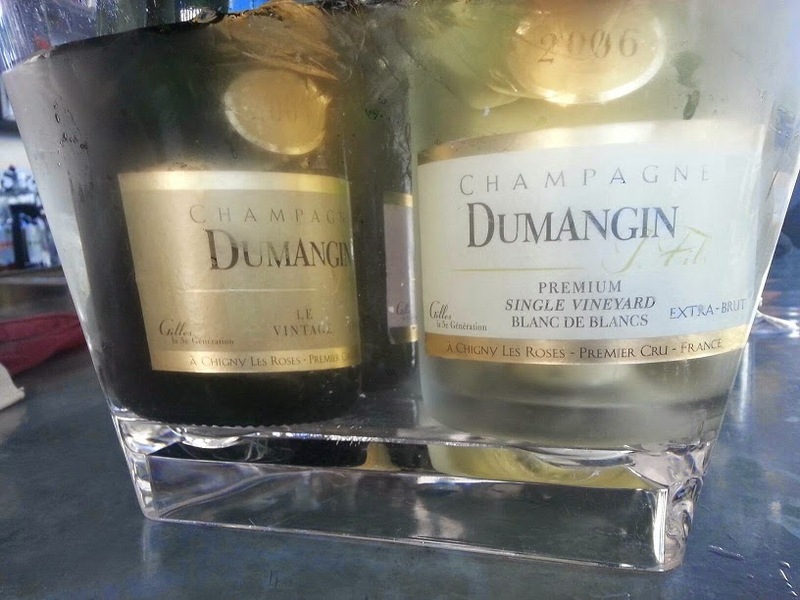 More: www.champagne-dumangin.com - photo: facebook.com/ChampagneDumangin. La Cuvée 17 Brut (1/3 each Chardonnay, Pinot Noir, Pinot Meunier) - Lightly nutty and yeasty notes, elegant and crisp mouth-feel, pretty dry (this was the 'least' dry of the five actually) with subtle tasty finish. L'Extra-Brut (50% Pinot Meunier, 25% each Chardonnay and Pinot Noir) – Very dry and mouthwatering with nutty and subtle yeast biscuit flavours, pretty intense and crisp finish but it works well. Like it although probably too dry for some. Le Vintage 2004 Extra Brut (54% Chardonnay, 46% Pinot Noir) – A touch richer and fuller, more complex flavours, crisp long finish, well balanced; very nice stylish Champers. Premium Blanc de Blancs 2006 Extra Brut (100% Chardonnay, single vineyard) – Enticing ageing characters vs still intense palate, concentrated and classy; lovely fizz. Premium Rosé de Saignée 2008 Extra Brut (50% Pinot Meunier, 25% each Chardonnay and Pinot Noir) – unusual rosé sparkler, cidery notes mixed with understated floral / red fruit flavours. 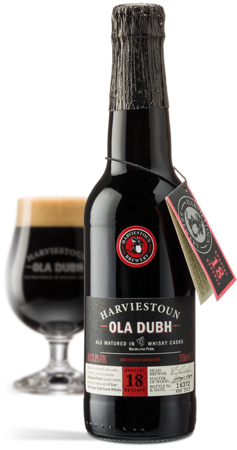 Available from Yapp Brothers in the UK for £29-£39 per bottle, in Australia and quite widely distributed across the USA. Lugana DOC 2013, Tenuta Roveglia (variety: Trebbiano di Lugana, 12.5% abv) - I've been through a few vintages of this consistently tasty dry white with a touch of richness yet fresh and crisp too, from vineyards near Lake Garda just in Lombardy on the border with neighbouring Veneto. Asda £7 although now de-listed as I haven't seen it recently? Shame. Aglianico del Vulture DOC 2009 (14% abv) - Aglianico is another slightly obscure grape worth seeking out, and this example from the Basilicata region (in the deep south found between the two regions mentioned above) shows enticing liquorice and wild herb notes. The 2009 is looking a bit old now, so enjoy it this winter: on offer at Sainsbury's for £6.75 (usually £9). Vermentino 2013 Tuscany (12%) - another new Italian white at Asda, give it a go for its floral character and elegant style; worth £6 on offer, although I wouldn't pay the "full" price (whatever that really is in any supermarket, with their deliberately confusing promotions and pricing policy, allegedly). With their new-ish winery built in the village of Larnage, this very northern Rhone Valley producer (mostly Syrah and Syrah...) has slowly expanded over the years to 25 hectares (62 acres) of different vineyard parcels spread around several villages in the Crozes, Hermitage and St. Joseph appellations. Philippe Belle has been running the show for over 10 years now, and helped his father Albert shape the piecemeal whole into a fully fledged estate winery in the 90s. www.domainebelle.com or via specialist exporter A Wine to Try. Les Pierrelles 2011 Crozes-Hermitage (100% Syrah from specific vineyards in the village areas of Pont d’Isère and Mercurol, aged for 14 months in barrels) - hints of spicy vanilla oak on a structured backdrop, the fruit was a little overrun by the wood at that time perhaps, but the wine's got nice depth and mouth weight; probably just needed more time to round out fully. Château de Corneilla aka Domaine Jonquères d'Oriola is another of those very old family wine estates you occasionally come across in the Roussillon (we're talking 15th century apparently). Now run by 30-something William who's continued shifting the focus a touch more towards making Côtes du Roussillon reds, although they still have a very good reputation for their traditional Vins Doux Naturels (VDN = fortified wines), such as the gracefully ageing Tuilé red (sort-of 'tawny' style) featured here. 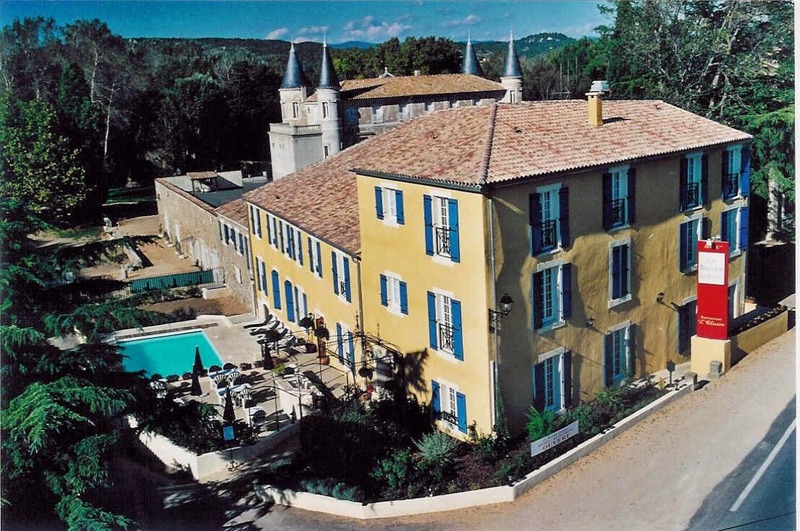 The Jonquères family owns two substantial vineyards around the historic village of Corneilla del Vercol, found a few kilometres south of Perpignan on the way to Saint Cyprien and Elne. Their site www.jonqueresdoriola.fr is "under construction." Rivesaltes Tuilé 2000 (Grenache, fortified to 16% abv) - caramelised pecan nut and red fruit cocktail, quite tangy and "fresh" almost with a bit of a kick then lingering maturing meaty flavours. Alluring VDN style, try with chocolate, nutty desserts or mature hard cheeses. £13 Roberson Wine, London. Côtes du Roussillon 2011 red (Carignan, Grenache, Syrah) - nice sweet berry and floral notes with tobacco edges, fresh bite still and light tannins on its attractive finish. £9.95 Roberson Wine. 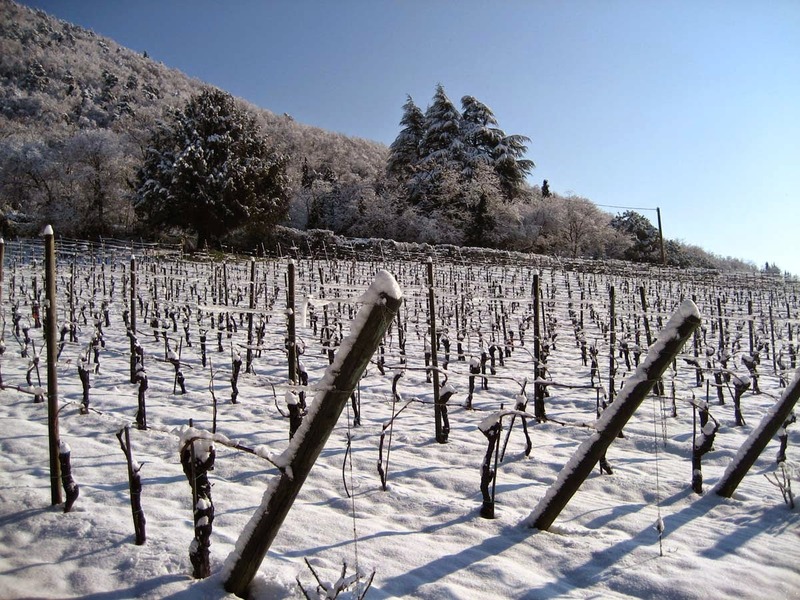 This top-notch Prosecco winery isn't far off its 100th birthday and was established by Antonio Franco in Valdobbiadene, right in the beautiful heart of the 'original' production zone marked by often steep hillside vineyards at altitude (hence the snowy shot above), which has recently become a much smaller and more quality-focused sub-zone (Prosecco can be made pretty much anywhere in the Veneto region or virtually the entire northeastern corner of Italy it seems). Nino Franco then expanded the family operation and grandson Primo, who's been in charge for over 30 years, has boosted exports substantially - it shouldn't be too difficult to find their wines in your neck of the woods. These ones are available in the UK/Ireland from JN Wine, Wine Drop and Sommelier's Choice among others starting at £13.50-£14 (€23) up to £25-ish; or Wine.com and many other outlets in the US (from about $18). Photo copied from www.ninofranco.it. Rustico NV - lively with lightly toasted almond and yeasty biscuit edges, quite intense fruity vs earthy flavours with long crisp vs toasty finish; very nice fizz. Vigneto della Riva di San Floriano 2013 - more 'vinous' and concentrated, attractive fruity vs baked bread-y mix of flavours with intense bite and length, lingering oat biscuit notes vs fresh and 'salty'; stylish and elegant. Grave di Stecca 2010 (old steep vineyard, longer lees ageing, only 7 gr/l residual sugar which is pretty dry) - quite rich and toasty with tangy nutty dry mouth-feel, more serious foodie fizz with lovely rounded vs crisp finish. See post on my other site: WineWriting.com: WES NI tastings and workshop in Belfast: "Christmas wines tutored tasting December 4 (Thursday) 7:30 - 9:00 PM £35 including nibbles. Special 'Christmas themed'..."
Or book using the PayPal buttons below (more about payments and subscribing HERE). This charming swanky 75 hectare estate hidden away outside the wee village of Bize-Minervois (between Capestang and Homps on the region's northern edge with the bottom tip of the Saint-Chinian appellation, if you get what I mean: or look at a map...) was bought by Gontran Dondain in 1997, who must have invested a good deal of time and wonga into restoring the property and vineyards. The newest developments are on-site apartments and spa complex to complement their hotel and seasonal restaurant (open May to end Sept). What self-respecting poshly renovated château in the Languedoc doesn't have this nowadays! Some good wines being made here but their “top” reds are quite pricey, although 2009 wasn't perhaps the best vintage to judge them on (hot and dry, many of them are now looking a bit clunky and out of balance with austere tannins), so I look forward to tasting some more recent vintages in the future. More info @ www.chateaucabezac.com where I pinched the handsome photo from. 2013 Cuvée Alice white (Maccabeu, Vermentino, Roussanne, Grenache blanc; 14% abv) – touches of honey/banana and yeast-lees vs a crisp 'mineral' side, juicy and refreshing with some roundness too. €7.30 cellar door / £8.77 UK. 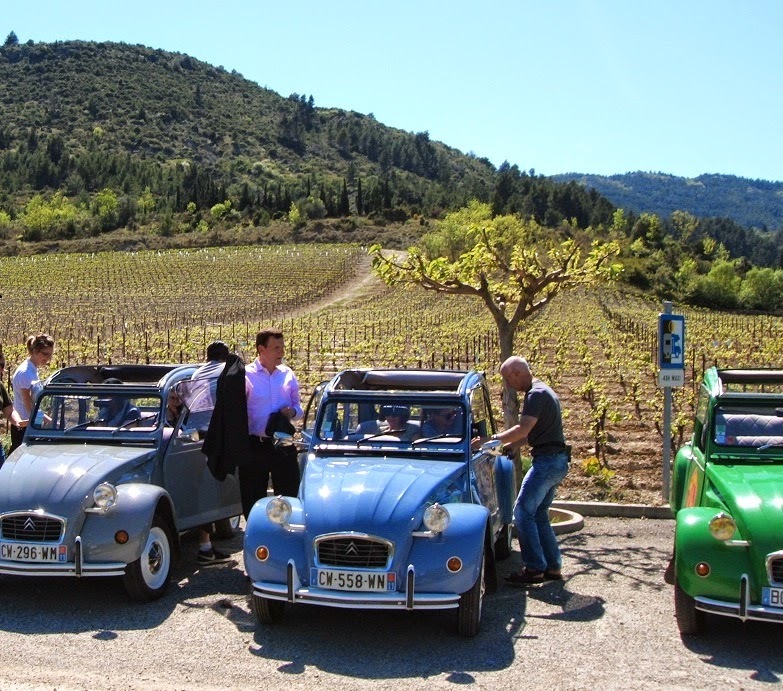 This is a preview snippet from my forthcoming 2014 Languedoc report - coming soon, honest! No, I haven't done a French-style August close-down but have been adding material to my WineWriting.com blog (click to read all about my latest Portuguese wine special for instance) among other (more constructive) things to do. Anyway, I'm now working on a hopefully substantial "special supplement" (for want of a better description) drawing on all things and people Languedoc tasted, seen and encountered over the course of the first half of this year: a trip to the region in April to the "Millésimes en Languedoc" showcase based in and around the City of Carcassonne (including some nice pics like the one I took below plus tips on eating, staying and alternative things to do, such as hiring or being driven around in a brightly coloured Citroen 2CV...), a tasting in Dublin and a couple of wine events in London. Fully updated profiles on Quinta do Portal and Aliança Vinhos de Portugal with their latest ranges reviewed (including a Portal Vintage Port retrospective featuring vintages from 1995 to 2000...), can be found in my new special Portugal report (click there for more info and to buy for just £2.50 or free if you subscribe for £10 a year). Includes RMJ's complete run-down on these wineries and several new wines. 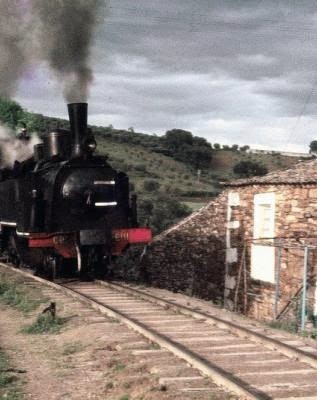 There's also a summary on my Portugal archive page HERE (scroll down). "The Menéres family estate was established in 1874, and the company is now run by João Pedro Menéres, José Clemente Menéres and Manuel Menéres Sampaio... "... We do not use any chemicals in our farming,” their site goes on in that glib manner. Ahh! That's the one thing that annoys me most about organic producers..." The complete rant, profile, reviews of the tasty wines below and where to get them can be found in my new special Portugal report (click there for more info and to buy or subscribe). 2013 Rosé (Tinta Cão, Tinta Roriz, Touriga Nacional – tank sample at the time) – yeast-lees notes, nice gummy zippy mouth-feel with fresh and gentle red fruit finish. Expensive though (in the UK anyway): £10.99. €6.25 cellar door. 2011 Moinho do Gato red (Tinta Barroca, Touriga Nacional, Tinta Roriz) – attractive soft fruity style with peppery touches, has a bit of grip vs juicy fruit on the finish. £8.99, $15. €4.50 cellar door. 2010 Quinta do Romeu red (Touriga Nacional, Tinta Roriz, Sousão) – aromatic floral red/blue berry fruits, nice soft fruity palate with light tannins and fresh acidity too; very attractive red drinking now. £10.85, $19. €6.25 cellar door. 2010 Reserva red (“field blend picked and fermented together with some oak ageing,” mostly Touriga Nacional with Touriga Franca and Sousão) – touch of coco oak and more structured vs still plenty of that nice juicy fruit, firmer finish yet well rounded too. £14.99, $27. €10.50 cellar door. "On our 'Wines of Italy' one-day workshop, we'll take you on a guided tour around several of this varied country's different wine producing regions and taste and talk about a dozen high quality wines. These will include classics from northern Italy, such as Piemonte and Veneto, central Italy such as Tuscany and Umbria, and the deep south e.g. Sicily, Sardinia or Puglia..."
"A mini tasting tour around the Cape wine-lands including popular varietals such as Pinotage, Shiraz and Chenin blanc, as well as some red and white blends highlighting the different winemaking styles, climate zones and terrain found in South Africa's diverse wine regions..."
More info and booking: wine-education-service.co.uk/wine-tasting-belfast or by Paypal - click on the button below. Tasting technique & classic grape varieties - Learn how to taste like a professional! Get to know some classic grape varieties. Wine production & classic grape varieties - Learn what goes on in vineyards and wineries. Get to know more classic grape varieties. The wines of France - Taste classic examples from Champagne, Burgundy, the Rhône Valley and Bordeaux. The wines of other European countries - Taste stylish examples from Austria, Germany, Hungary, Italy, Portugal and Spain. The wines of the New World - Taste signature wines from Australia, New Zealand, South Africa, Chile, Argentina and California. "We'll taste and talk about a focused range of red, white, rosé and fortified wines selected to highlight the very different regions, grape varieties and wine styles found across the 'Iberian peninsular'. This will include well-known classics such as Rioja, the Douro Valley and Sherry but throwing in a few surprises too..."
"Christmas tasting" including Champagne and Port and some nibbles - more info to follow. Booking: wine-education-service.co.uk/wine-tasting-belfast or by Paypal - click on the button below.